Ah, squiders, we all know Goodnight Moon, right? It’s a classic from the ’40s or some such. Good night, room. Good night, moon. Good night, cow jumping over the moon. And so on. We have my husband’s copy from when he was a kid that we have recently broken out to use again with the next generation. Such a sweet, calming book. Goodnight nobody. Because that’s not creepy. It’s creepy in the way that small children are sometimes creepy, like when they stare at the corner and hold a conversation with no one. You know they’re probably just practicing their language skills, but there’s some small part of you that worries that there’s actually someone there that you can’t see–and they can. Goodnight noises everywhere. Innocuous enough by itself, but by now I’m worried about nobody and I’ve started to wonder what sort of noises we’re talking about. 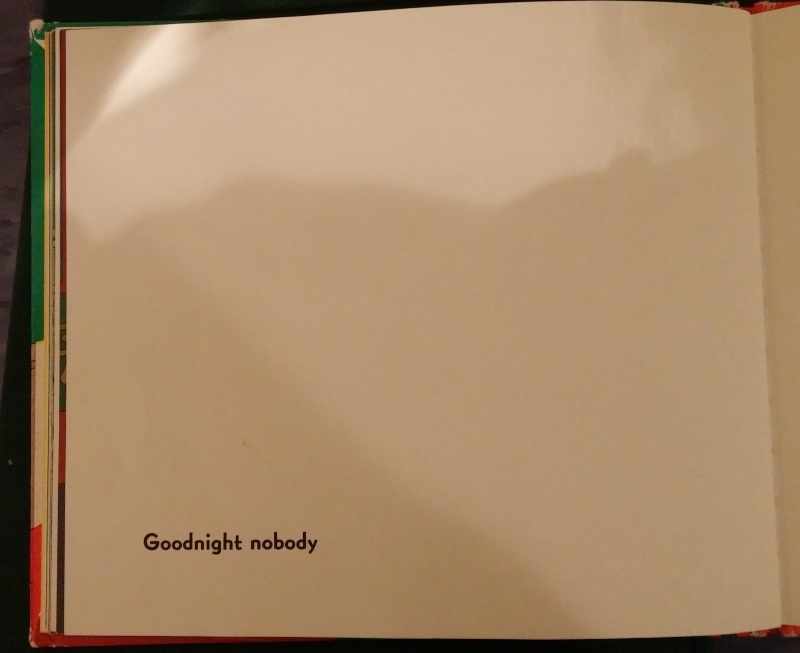 Now, of course the story hasn’t changed since I was a kid, and I certainly had no recollection of these particular pages, but I think that (sadly) as an adult it’s easier to look at something and worry about what something means, whereas as a kid, you’re just like, “Goodnight nobody. Sure, of course, why not?” and it doesn’t faze you in the least. Anyway! Happy forthcoming Halloween, squiders! Good morning, Squiders! Today I am pleased to reveal the cover for KD’s newest book, being released through Turtleduck Press on Nov 1st! 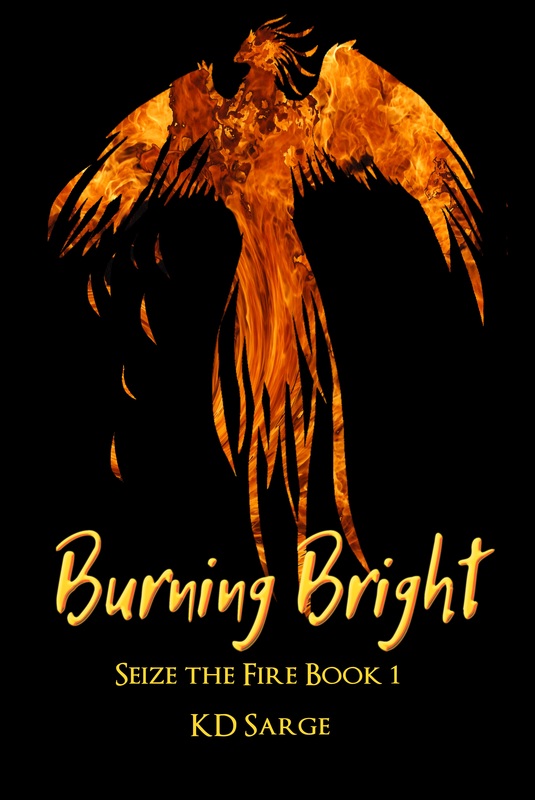 Burning Bright is the first in a fantasy trilogy. Mmmm…fire. Previews and more information can be found on Turtleduck Press’s website. I love October, squiders. You know that. It’s autumn! My birthday! The start of the holidays (which I have heard appropriately referred to as Halloween, Nanowrimo, and Christmas)! I love October. I can break out the hot chocolate and snuggle under blankets and watch ridiculous movies. But this year, October does not love me. Everyone in the family has been sick, some in that vague, lingering way where you’re not really sick, just tired. I’m sick and tired. Nobody’s naps line up in a useful manner. I did nothing for my birthday, though I did get some nice cake. Things keep breaking in weird, inexplicable and time-consuming manners. Normal routines and chores go horribly awry. I feel like I’m being more scatterbrained than usual. Oh, and my website is still down. Super annoyed about that. How am I supposed to market/network/etc. without my website? What the heck, October? I adore you, and this is how you repay me? Fie on you, October. Fie on you! I just want to get work done! My novel draft, and some short stories that just need a little bit of editing, and a new collection to come out in December. And my other novel that is ready to start querying. Can’t you just let me get somewhere with some of them? One of them? Any of them? I’m sorely tempted to just sleep for the rest of the month. The only good thing really happening is that I’m finally getting some reading back in (the beginning of the month ate that too). I finished Jay Kristoff’s Stormdancer yesterday which, once I got past the truly awful beginning, was pretty good. And I started Sarah J. Maas’ Throne of Glass which I’m really enjoying. Apparently I’m on a YA fantasy kick at the moment, but it may be all that’s keeping me sane. What do you do, Squiders, when life just piles up on top of you? Ah, squiders. Have you ever had a book that you picked up, read part of, and then put down, through no fault of the book itself? You told yourself you’d get back to it. But then time stretched on and on, and you forgot what happened in the part you read, and the book got stuffed some place random and you’re not sure where it is, or it was due back to the library, and for some reason it’s too much work to request it again, etc. I had a book like that. I started it as an extra credit assignment during AP history my sophomore year of high school. I liked what I read for the assignment, and so figured I would read the whole book. Except now I have! Finally. It has sat on my bookcase since sophomore history, staring at me, but I finally cracked it open and read the whole thing. And I wish I had read it as a teenager, honestly. I think I would have appreciated it more then. As an adult, I enjoyed the philosophy parts fine, but felt disconnected from the characters and somewhat underwhelmed with the meta take the book goes on starting about halfway through. All that time just to not particularly like the book. Is there a lesson to be taken away from this, squiders? Maybe. Something like: just finish the dang book within a reasonable time. Ever had a book that took you forever to get through? Thoughts on Sophie’s World in general? Writing is an interesting thing to learn, because nobody’s processes are the same, nobody learns the same, nobody focuses on the same things while actually writing, and there’s no guarantee that something that was an epiphany for one person will even resonate with someone else. When I was younger, I tried reading some writing books and gave up on the whole lot of them because they weren’t working for me. They either were telling me things I already understood, or the techniques they were suggesting seemed weird and arbitrary. But as I’ve gotten older, I’ve realized that when you read a writing book or take a writing class, nothing is ever going to be a perfect fit, because everyone is different. So, what you do is take when does work for you, what does resonate, and you drop the stuff that doesn’t. Sometimes there will be that near-perfect class that snaps something you weren’t quite getting into perspective. And sometimes there will be a class that rubs you wrong the whole way through and you only emerge with a couple of new tidbits that kind of work. The important thing to remember is that just because a class doesn’t work for you doesn’t mean it won’t work for others. I just finished up a flash fiction course that a friend took and found very helpful, but the process rubbed me wrong the whole way through. Is it a bad class? No. It just didn’t work for me. Process thing. I still picked up a few things that will be good to think about in the future, even so. So, how do you know if a class will work for you? Well–you don’t until you try. As time goes on, you’ll be able to tell what sorts of things work for you versus what doesn’t (for example, I hate writing to prompts just to write to prompts, and anything that promises “writing exercises” will pretty much make me want to scream) so you’ll be able to make some decisions based on class/book descriptions. If you know other writers with similar processes to yours, what worked for them might work for you. But otherwise–who knows? And something that might not sound great at first glance might be perfect. What has worked for you? Any classes/books you found amazing? Any you found not so great? Oy, my main website got hacked. Boo hiss. ANYWAY. There seems to be a trend toward community input these days. The general public has become the gatekeepers, and I think that’s okay. Things like indiegogo, Patreon, and Kickstarter allow people to support projects and artists they believe in and that they enjoy, even if those people might not be able–or want to–go through more traditional channels. Self-publishing has somewhat done the same things for writing, but there are so many books out there, which makes it hard for self-published authors to connect with readers. So I’ve started to see some services come into being recently that allow authors to reach a reading community that just might work for them without having to go it alone. I’ve been looking at two of these services myself, because they kind of seem like fun. The first is Inkshares. Inkshares works more like Kickstarter. Authors pitch their stories, readers back said ideas, and when enough “pre-orders” are attached to a book, Inkshares professionally publishes (with an editor, designer, etc.) said book. Authors earn royalties as well past the initial process. Authors can also gain draft feedback before the start the pre-order process. The second is JukePop. JukePop allows you to release a story serially. Stories that update at least monthly are eligible for rewards which can be used to offset publishing costs. Readers can vote and leave comments on stories as they go, and the ones with the most votes get the most rewards. I haven’t used either of these services myself, but I do think they sound interesting, both from a reader or a writer perspective, so if they sound good to you too, you should check them out. And maybe, when I find myself in need of a new project, I’ll set something up on one or both of them. What do you think?